The home remodeling process can be an overwhelming experience, filled with countless choices, not only about products and colors, but also about budget and who you will eventually enlist to help you complete your project. 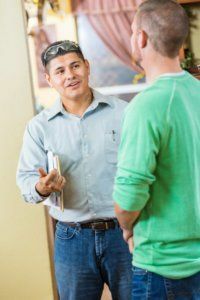 Recent reports state that word-of-mouth referrals continue to be the most common way for homeowners to find a local remodeler. Typically, your best sources for leads include everyone from relatives, friends and neighbors to colleagues and even real estate agents. Remember: Find a good, reliable remodeler does not have to be difficult. By following these tips you can make the selection process easier, and be better prepared to make an informed decision that best suits your needs. Scottsdale home remodeling contractors are compelled to perform quality work that satisfies local community members – especially if it’s in order for their business to thrive and survive. Check your local firms through word-of-mouth referrals or through your local National Association of the Remodeling Industry (NARI) chapter. If a remodeling company is not offering references, you should ask for them anyway. It’s also a good idea to follow up with a phone call. If you are getting estimates from more than one remodeler, be sure they are working off the same type and quality of work. Discuss variations in prices, and be wary of any estimate that is considerably lower than the others. Another advantage to hiring a local professional who works in your community is that he or she will likely know the local building code and permit requirements. Building codes vary in each jurisdiction and even sometimes change yearly. Keep in mind that most structural work or footprint expansions require permits. Some states require contractors to be licensed, bonded and insured. Ask your area licensing agency to confirm that the contractor you are interested in hiring meets all requirements. According to NARI, most states require contractors to carry documents, including worker’s comp, property damage and personal liability insurance. Additionally, ask for a copy of their license and insurance certificate to make sure they are up-to-date. From the very first visit, Republic West Remodeling’s design professionals will work with homeowners to assure that your vision, ideas, budget and timeline expectations are met. Our team of professionals have developed, through 15 years of experience and a passion for excellence, an exclusive process that delivers top quality service to each and every client.